Invita Skin Beauty Caps 60 Stk. Invita Skin Beauty is a product counted among nutricosmetics, i.e. dietary supplements created specifically to improve condition of the skin. Invita Skin Beauty is a product counted among nutricosmetics, i.e. dietary supplements created specifically to improve condition of the skin. The components used in the product, including very assimilable lyophilized Collagen, Sea algae unusually rich in nutrients, and very effective Vitamin E, and have positive effects on the skin from the first application. The dietary supplement manufactured by our company contains the Sea algae (Fucus vesiculosus), lyophilised fish Collagen deposited on lemon carrier, Vitamin E in form of D-alpha-tocopheryl acetate. The product also contains trace amounts of lyophilised Elastin and Lactic acid. The mixture prepared from these components is closed into porcine-gelatine capsules which are then packed into 10-piece blister packages. Finished blister packages are packed into commercial cardboard boxes. Vitamin E slows down the aging process of tissues protecting them from oxidative stress, Iodine helps maintain the proper condition of the skin. 1-2 capsules dietary supplement during the day, preferably after meals to increase its assimilation. Not exceed daily recommended dose. Not use in case of hypersensitivity to any component of the product. Balanced diet and a healthy lifestyle are important for maintaining proper health. Keep in the dry and darkened place, in the room temperature. Keep away from small children. Expiry date on the bottom of the package. Algae (Fucus vesiculosus), collagen, vitamin E (D-a-tocopheryl acetate) from soya, fish gelatin – capsule, citric lyophilizate - carrier. Iodine helps maintain the proper condition of the skin. Es lohnt sich eine 3 Monatskur. Tolle Haut und ich finde mein Bindegewebe ist besser geworden. Ich bin hin und weg, ich leide seit Jahren unter starker Akne. Mein Hautarzt hat mir dann zu den Kapseln und dem Face Collagen geraten. Es ist echt unglaublich, wie sich meine Haut verbessert hat. Leute, diese Produkte helfen echt!!! Diese Nahrungsergänzung kann ich wirklich weiterempfehlen. Ich bin 64 Jahre und zusammen mit der Tagespflege hat sich meine Haut wirklich zum postiven verändert. Ich hab weniger Falten und meine Haut ist viel praller und rosiger. Fine-grained natural peeling molecule of ground oyster shells does not peel the epidermis gently only, but it also improves the micro-circulation and supplies valuable elements such as calcium, magnesium, iron, potassium and zinc. 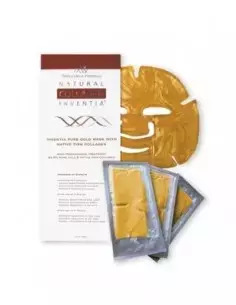 Gold Masks are a unique product with a wide variety of active ingredients, including exceptional and precious particles of Gold. 3 Stk. 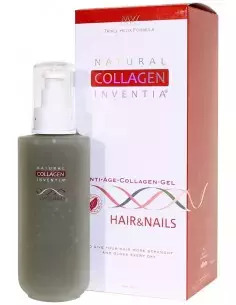 Hair and Nails Inventia Collagen is used in hairdressing and beauty salons very successfully. It is also used for skin care. Collagen Day Cream contains collagen and Matrixyl ® 3000, which have strong anti-wrinkle properties. The product is a collagen gel, which is characterized by homogeneous gel consistency with a slightly opalescent colour and faint characteristic smell. We bri   you beauty - from Luxembourg. As a German contact, we are responsible for your well-being in the region.